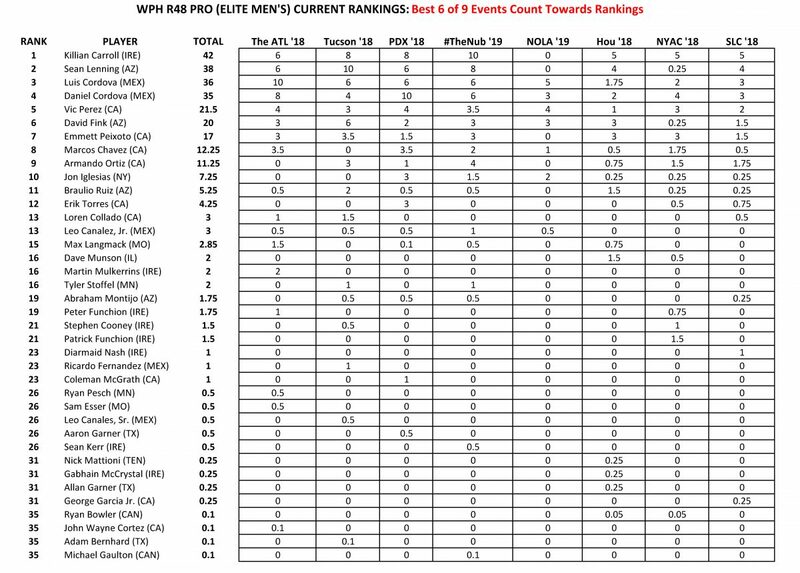 New Orleans, LA, WPH Press, 2/17/19- The WPH staged its first ever R48LTE alongside the second SR48 stop of the 2018/19 season event in New Orleans, featuring five of the top 10 R48 stars and the top three SR48 stars. Lucho Cordova won his second R48 stop of the season and became the first R48LTE champion in history, defeating first-time R48 finalist Vic Perez in the final. With his finals appearance, Perez climbed into the R48 top five for the first time in his career. Jonathan Iglesias’ fifth place New Orleans finish pushed the Vail star into the top 10 for the first time since 2016. On the SR48, David Fink won his second stop of the season to stay at number one, while New Orleans SR48 finalist Marcos Chavez stayed at number two and New Orleans SR48 third place finisher George Garcia, Jr. maintained his number three ranking with a third place New Orleans finish.